Its official, Facebook is king in Indonesia. Just now i checked on Alexa.com and to my surprise, Facebook who was number 2 last month is now the number one top site in Indonesia. You can see the chart here. Beating Google and Yahoo. Something thats unimaginable before. Since theoritically 70% of all user starts their activity from search engine page. Facebook rise altough it has been forecasted, but no one has predicted that they will come to Indonesia like this. 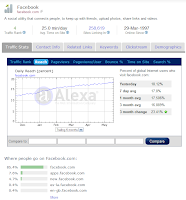 Last year, in August 2008 Facebook user is only some 600 thousand users. But now we have almost 2 million users from Indonesia. With the spike of user growth happens in late 2008. Coincidentally with the growth of BlackBerry. In fact, one of the reason that we are having lots and lots of crackberry (blackberry user :P) nowadays in Indonesia is facebook. Push mail and internet messaging is not the killer app. But facebook is. Blackberry has moved from business phone into a social phone. I guess facebook entered Indonesia at the right time. Internet is getting cheaper. Everyone is starting to access the internet from their mobile phone. And off course, the BlackBerry factor. For now, google and yahoo must find a way to get back into the number one spot. The king is dead. Long live the king !